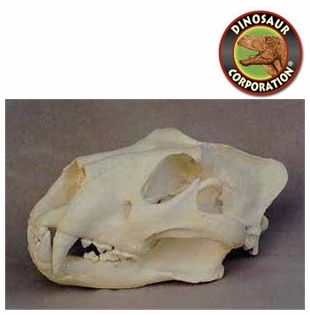 African Lion skull replica is cast from original specimen. Panthera leon Felidae. The lion (Panthera leo) is one of the five big cats in the genus Panthera and a member of the family Felidae. The commonly used term African lion collectively denotes the several subspecies found in Africa. With some males exceeding 250 kg (550 lb) in weight it is the second-largest living cat after the tiger. Lions live for 10�14 years in the wild, although in captivity they can live more than 20 years. In the wild, males seldom live longer than 10 years, as injuries sustained from continual fighting with rival males greatly reduce their longevity. They typically inhabit savanna and grassland, although they may take to bush and forest. Lions are unusually social compared to other cats.